The end of the academic year is upon us. For ICS high schoolers this means what it does for students everywhere: finals. Da-da-da-DUM. ICS high school students are on a special three-day exam schedule this week. On Thursday and Friday, and Monday next week, they all file into the gym twice a day to sit in regimented rows of desks where they take two-hour exams in each of their academic subjects. No books and no notes are permitted for any subject area. The chemistry teacher put a little candy on each desk this morning. Isn’t that nice? 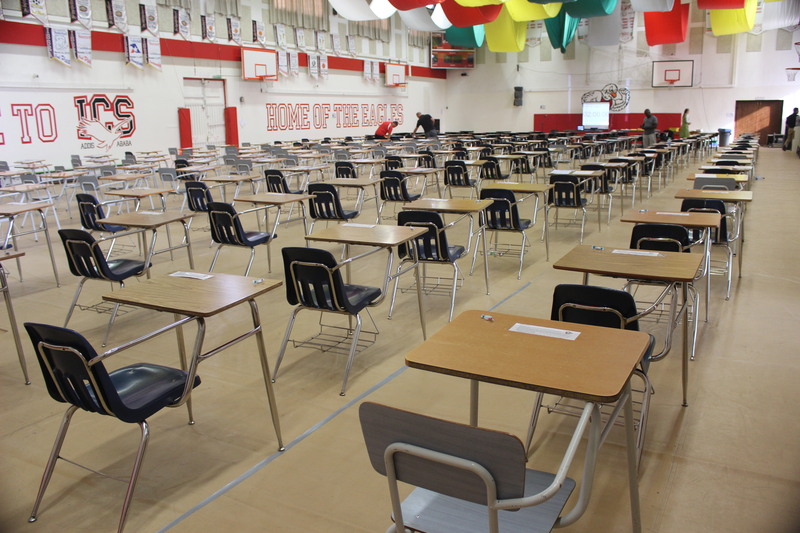 Eleventh-graders all have six exams each, but some in grades 9 and 10 have fewer. Yesterday Alekka had English and Spanish. Today is chemistry. Monday is math (her pre-calc teacher happens to be American, otherwise it would be “maths”). Although most ICS teachers are American, the official academic lingo around here tends toward the British. I’m not exactly sure why that is, probably the IB program plus the school’s continued effort to rebrand itself as international rather than “the American school,” as it was previously known. So instead of “reviewing” for the tests, students “revise”. They don’t “take” exams, they “sit” them. And “proctoring” is known as “invigilation.” Sounds painful, doesn’t it? I think for many of them it is, at least a little bit. They sure have been studying like crazy for the past couple of weeks. An Australian teacher said to me this morning that she thinks “proctoring” sounds worse than “invigilation.” Those plain-speaking educators down under call it “supervising.” Imagine that. This entry was posted in International Community School, Teaching. Bookmark the permalink.